Technique: Does Your Studio Need A Digital Master Clock? From sports to computer programming, it seems that theres an extreme version of everything these days. So what is extreme sample conversion, and how is it better than the ordinary kind? This small but mighty orchestral package continues to square up to the big guys. If you actually owned every amplifier, stomp box and microphone thats emulated in Amplitube 3, youd need a bigger house. But does more always equal better? This compressor offers automatic time constants to help to keep things sounding natural, even with plenty of gain reduction. Is it a weapon worth adding to your arsenal of mix tools? We get hands-on with Korgs touchy-feely new synth. This latest collection from Loopmasters comes courtesy of noted DJ, producer and remixer Tim Healey and production partner Marc Adamo, and weighs in at a hefty 3.9GB. Back in 1994, jungle producer Renegade (aka Ray Keith) released a record called 'The Terrorist', and it's probably fair to say that the jungle and drum & bass scenes haven't been the same since. For the latest addition to the Real range, Music Lab have turned their expert attention to the classic Les Paul Custom. There are few pieces of soundtrack furniture better guaranteed to get that adrenalin surging than a team of perspiring percussionists giving their instruments a good drubbing. Can a ribbon mic really offer professional polish at such a bargain price? Better known for their high-end modular outboard processors, Tonelux have scaled their EQ up to full rack size. Does more space mean a better feature set? Isolating your guitar cabinet allows you to crank up your amp on recording sessions — but without deafening the neighbours! Yamahas new flagship stage piano is unashamedly specialist and expensive. How does it rank alongside the best sampled and modelled alternatives, or indeed the original instruments it strives to emulate? Zooms H4N audio recorder has been very well received. Can the new Q3 repeat that success by throwing in video as well? In the second part of this short introductory series, we cover the more technical aspects of film-making, demystifying some of the jargon that might trip up the video newbie. The expanded audio clip slicing introduced in Live 8 is a powerful creative tool. We show you how it works. You can get the amp and stomp-box collection youve always wanted now that Logic offers Pedalboard and Amp Designer. Reason doesnt have a dedicated multi-band compressor, but that doesnt mean you cant build your own. Plug-ins are likely to be integral to how you work, so its worth making sure theyre organised and well behaved. Upgrading a studio in Clacton. Waves ground-breaking Vocal Rider plug-in takes the pain out of vocal level-automation, but if your budget cant stretch that far, you can get part of the way there using nothing more than Cubase 5s built-in processors. Audio files in our SoundCloud player, with downloadable high-res WAVs for your convenience. Read more about Does Your Studio Need A Digital Master Clock? Listen to streaming MP3 Audio files in our SoundCloud player, with downloadable hi-res WAVs for your convenience. Know how to use the Pro Tools master fader properly and you need never suffer clipping in your mixes again. iPad — A Great Tool For Musicians? Is Apples latest product simply a great lifestyle device, or is it also the next great tool for musicians? Read more about iPad — A Great Tool For Musicians? The Starcraft players of South Korea are the ultimate computer power users, and their skills and strategies have the potential to transform your DAW sessions. What is the point of investing hard-won money into quality mics, preamps and so-forth, if your recording room's acoustics are letting the side down and colouring your mixes? Find out how to use our SoundCloud.com account to submit your review tracks to SOS. Sometimes the simplest-sounding music takes the most work to get right, and so it was with Johnny Cashs posthumous hit album American VI: Aint No Grave. Engineer and mixer David R Ferguson was on hand at every stage of Rick Rubins production. In 1968, Tommy James made a dramatic stylistic turnaround, swapping bubblegum pop for full-blown psychedelic rock. The result was the superlative single Crimson & Clover. Read more about Q. How can I distribute my music online? Read more about Q. How can I get ‘harsh’ vocals to sit properly in the mix? Q. How do normal DAWs differ from mastering workstations? Read more about Q. How do normal DAWs differ from mastering workstations? Q. How should I mike-up a violin? Read more about Q. How should I mike-up a violin? Read more about Q. Should I upgrade to a Mac Pro for more Firewire ports? Q. Which MIDI velocity curve should I use with my controller keyboard? Read more about Q. Which MIDI velocity curve should I use with my controller keyboard? Not everyone has yet made the leap to Windows 7, so if youre a musician, what are the benefits of upgrading? Read more about Why Upgrade To Windows 7? How to get ahead in the business? Honour thy deadlines, have no other gods before work, and dont commit murder unless theres a particularly juicy commission at stake. 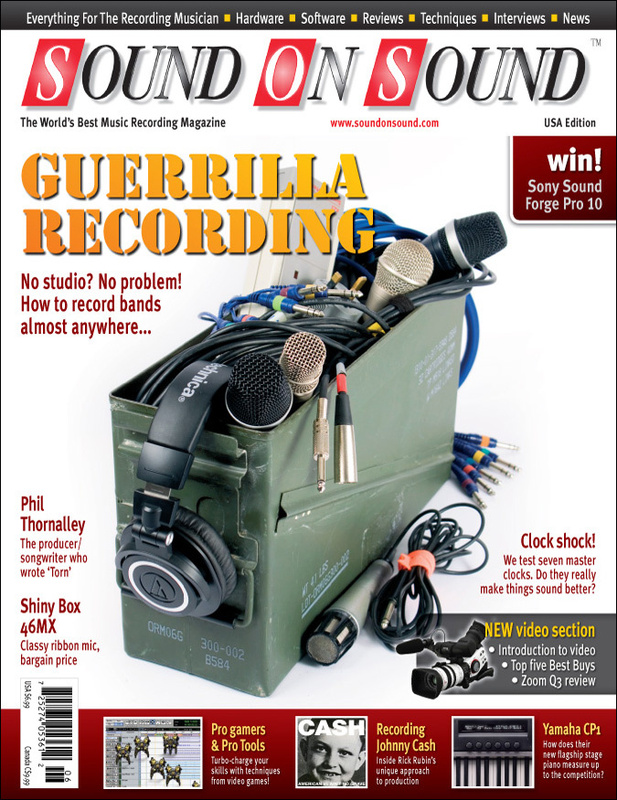 Media content for the June 2010 issue.